With the UEFA European Championship, Wimbledon and the Olympics all taking place this summer, City News finds out how psychology can be the difference between winning and losing. A fraction of a second is all it takes. 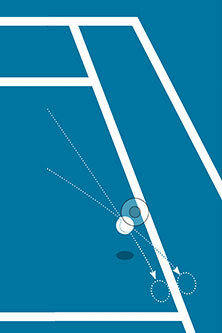 A forehand hit down the line in a Wimbledon final or a football deftly chipped over the diving goalkeeper in the last moments of a fraught penalty shoot-out in the finals of the European Championships. Such moments will define legacies and careers this summer, but beyond a fortuitous set of genes, what sets the competitors in these events apart from the amateurs, Sunday morning regulars and those of us who simply watch from the comfort of our sofas? In the Department of Psychology, several academics are exploring how such decision-making at the neural and behavioural level are affecting outcomes. When discussing sports stars we often herald their skills on the court or field. Skill itself is an interesting concept, as although often arbitrarily assigned, a skilled professional can be defined as a person who has had the motivation to practise one thing for approximately 10,000 hours extended over more than 10 years. But what changes are going on in the brain during these long hours of practice? Within our brains we all have a trainable internal simulation model known as the ‘forward model’. This enables us to simulate and predict movement of either a body part or an object, allowing precise actions that are too fast to rely on sensory feedback from your eyes and other parts of our body. 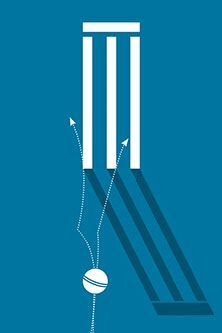 Academics are seeking to understand better what enables elite sportspeople to have such an advantage when it comes to making decisions and anticipating the movement and shots of an opponent. At City, Dr Kielan Yarrow, Senior Lecturer in the Department of Psychology, is using a computational approach to explore what parts of the brain and certain body cues are involved. Looking at a one-versus-one situation such as a tennis match, Kielan is using a method known as visual psychophysics in collaboration with Professor Joshua Solomon in the School of Health Sciences to understand what confers such an advantage. Using a particular technique called reverse correlation, they introduce large ‘bubbles’ into a video of a certain activity. By introducing gaps to part of the video in the form of bubbles that block out some of the athlete’s arm or shoulder, the scientists can see exactly what part of the body – and its associated body cues – are needed for people to guess correctly and make decisions on where the ball will be hit. “As many sports are played under extreme time pressure, a key distinguishing feature of expert performance is the ability to react to sports-specific events with seeming time to spare. This ability often manifests itself in scenarios requiring complex choices, like selecting the right pass or shot. In essence, the expert is able to anticipate how a sporting scenario will unfold based on a detailed understanding of situational probabilities,” says Kielan. “As a result, a skilled athlete could be considered a person who has learnt very good forward models which allows them to plan a better movement in any given context. For example, a professional tennis player has learnt an accurate forward model of their arm, their racket and even of the actions of their opponent based on their body cues. This knowledge allows the player to decide on the best control policy for that moment in time. As a result they are experts at anticipatory advantage due to mainly training and a bit of genetic advantage,” he adds. But while the computational parts of our brain can give us great benefits in certain situations following thousands of hours of practice and a perfectly honed anticipatory advantage, we can still be the architects of our own downfall due to our own behavioural decision-making. Professor Peter Ayton, Associate Dean Research and Deputy Dean, is interested in behavioural decision theory, specifically how people make judgments and decisions under certain conditions. This work has led him to football and penalties. To understand better the decision-making processes that go on in something as seemingly simple as a penalty shoot-out, it is necessary to go back 40 years to 1976 and the European Championships. In a penalty shoot-out it used to be assumed that there were essentially two options – either place the ball to the right or the left of the goalkeeper, giving them a chance to dive to either side. But an event in 1976 changed forever the way penalties are taken. A Czechoslovakian player known as Antonín Panenka became famous following the last penalty kick in the 1976 European Championships when, under huge pressure, Panenka feigned shooting to the side of the goal – causing the goalkeeper to dive to his left – before gently chipping the ball into the middle of the net. Before this event the choice had appeared binary, yet this moment introduced a third option. For goalkeepers life got harder – now they had to guess which of three locations the kicker would choose. While the average success rate for penalty kicks pre-Panenka from 1963 to 1973 was 69 per cent, the average success rate post-Panenka from 1977 to 1987 went up to 77 per cent as penalty takers realised this was a viable and acceptable option. Looking at the penalties more closely, Professor Ayton found that despite their higher success rate, penalties aimed at the centre of the goal are rare. He found that for all the World Cup penalty shootouts, only 30 penalties out of 204 – 14.7 per cent, were aimed at the middle third of the goal. 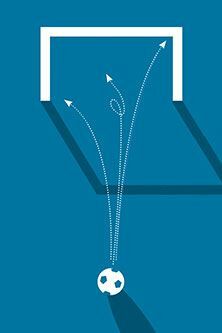 “Although it takes nerve to chip the ball down the middle, every penalty taken in a World Cup penalty shootout which was aimed high directly at the middle of the goal resulted in a goal. So why, given the higher success rate of penalties aimed at the middle of the goal, are there so few of them?” he asks. To help us understand why this happens we can use Norm Theory. Taking its name from the idea that people‘s expectations are based on what is typical, we can apply this concept to penalties to explain such behaviour. Research by other academics in 2008 confirmed this, as they found that goalkeepers would feel worse about conceding a goal when standing in the middle than when diving to either side. “Diving and missing – or even diving the wrong way – at least shows you made a conspicuous effort. Not moving looks suspiciously like not caring. But a curious double tragedy arises as a result of conforming to the norms: the data indicate that penalty takers would score more goals if they more often targeted the middle rather than aiming to one side; at the same time goalkeepers would save more penalties if they were brave enough to violate the norm for diving to one side and stood in the middle more often” continues Peter. “This shows the power of decision biases. Despite the fact that penalties placed down the middle having a significantly higher likelihood of success and that goalkeepers could improve their success rates if they stayed in the middle more often, both continue to err towards the norm. This apparently biased decision making is particularly striking since both penalty takers and goalkeepers have huge incentives to make correct decisions and it is a decision they encounter frequently” he concludes. Decision-making is critical and complex, but by using psychology to understand better why we do what we do, we can help to explain sporting skill at the highest levels of performance. So what does elevate certain individuals above the rest of us? Certainly thousands of hours of practice can help develop the anticipatory advance that distinguishes elite performers. But while such decision-making is undeniably important and can be the difference between winning and losing, at a different level there are fallacies and biases in decision-making that can also affect performance. As a result, psychological research at City can help us explain certain aspects of sporting skill at the highest level and understand better how we predict behaviour and develop better approaches to counter it. Clearly a more scientific approach to sport can make a significant difference at a certain level. As seen by Panenka, when you challenge the norm, it can lead to great changes in the sport. Clearly the mind games have only just begun.